Fugakyu: In Japanese, Fugakyu means "House of Exquisite Elegance", and that it is. The restaurant is decorated with gleaming wood, private screened bamboo booths and an overhead video screen with gorgeous scenes of Japan. A large, circular sushi bar welcomes you into the restaurant. Little wooden boats float past you with a variety of sushi selections. In the dining room, the extensive menu includes not only sushi, but sashimi, tempura, teriyaki and many more traditional and nouveau dishes rarely found outside of Japan. Plus, dessert is a must! The tempura green tea ice cream is a real treat to end a satisfying meal. Every dish is presented like artwork by a waitstaff wearing kimonos. 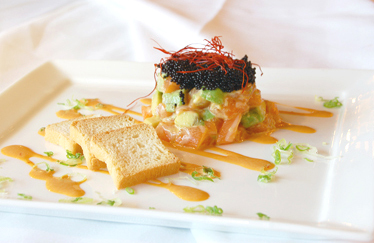 The award winning Fugakyu has taken top honors from Zagat, Boston Magazine, Citysearch, TV Diner and the Phantom Gourmet.